Election 2010 Find NPR's coverage of key races, analysis of what each party stands to gain — or lose — and what it all means for voters. The Leadership: Who's In Charge Of Congress? January 5, 2011  Check out the faces of the new Republican leadership in the House and see the Democrats who remain in charge of the Senate. November 23, 2010  Rep. Dan Maffei, a freshman Democrat from upstate New York (Syracuse), has conceded defeat to Republican challenger Ann Marie Buerkle. November 23, 2010  Minnesota, home of a famous recount in its 2008 Senate race, will now recount the 2.1 million votes cast in its still-too-close-to-call gubernatorial race. 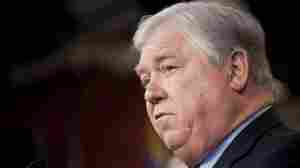 November 23, 2010  The GOP claims another House seat, as Rep. Solomon Ortiz (D), who has been in Congress since the seat was created in 1982, concedes defeat to Republican challenger Blake Farenthold. November 16, 2010  Sen. Murkowski has opened a 1,700 point lead over Joe Miller via her write-in votes. Her lead is only expected to grow as the more than 8,000 remaining write-in votes are counted. November 15, 2010  President Obama is signaling that he plans to push hard for bipartisanship. It's an appeal to political independents who say they're against gridlock and want the president and congressional leaders to work together. If John Boehner Can't Be Rebel Or Compromiser, What's Left? 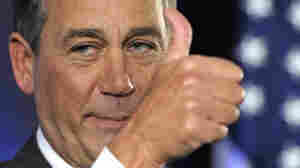 November 15, 2010  Boehner tells GOP freshmen they may spend the next 2 years fighting basically fighting Obama. That would seem to rule out him being a compromiser. And the fact that he'll be running Congress rules out a rebel role. So where does that leave him? Tea Party Lawmakers Welcome Themselves To D.C.
November 13, 2010  The newly elected politicians are coming to Washington, D.C., to get acquainted with the institution they will be joining -- an institution they criticized during the campaign. The Tea Party is even holding its own sessions this weekend -- before the official House orientation. 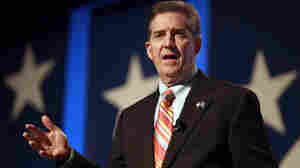 November 12, 2010  Conservative Republicans have a new champion: Sen. Jim DeMint of South Carolina, whose strategy in the midterm elections has given him new clout in the Republican Party. Behind DeMint's ascent is a combination of faith and fundraising. November 11, 2010  Two political scientists wryly note that the historical odds are in favor of a second term. And the scatter plot graph in their post does help make their point. November 11, 2010  It's going to take about five days to count the 90,000 ballots. But after the first day and with 20% of them tabulated, the senator was getting the vast majority of the votes. November 10, 2010  The judge said Miller didn't prove he would suffer irreparable harm if the vote count continued. Meanwhile, of the portion of the more than 92,000 ballots counted so far, 89 percent were for Murkowski. November 10, 2010  Alaska officials began counting the write-in votes Wednesday in the undecided Senate race. After incumbent Lisa Murkowski lost in the GOP primary, she ran as a write-in candidate, along with more than 100 other Alaskans. While Sarah Palin and other conservatives, including Jim DeMint, are backing Republican nominee Joe Miller, more votes were cast for write-in candidates than for Miller or the Democrat on Election Day. NPR's Martin Kaste updates host Melissa Block on the story. November 10, 2010  Miller has filed a federal suit to exclude ballots on which Murkowski's name is misspelled. But he's fighting an uphill battle since federal courts tend to defer to state officials in the running of elections. November 9, 2010  As they move into the minority in the House of Representatives, Democratic members will rediscover that when it comes to making legislation in that chamber, the Republican majority will hold nearly all the cards. November 9, 2010  Issa plans to hold more hearings in a year than Democrats held the last two years of the Bush era. November 8, 2010  Steele claimed credit for recent GOP wins with more than any RNC head since 1938. He also asserted that based on last week's results the GOP is much more diverse. While that may be true for candidates, it doesn't square with exit polls of voters. November 8, 2010  Bachmann, founder of the House Tea Party Caucus, wasn't picked for the House's GOP transition team. But House GOP officials chose some members backed by the Tea Party movement. November 8, 2010  Republicans put a lot of money and effort into winning gubernatorial contests in 10 "swing states." The GOP was victorious in nine and that should help Republican candidates for the White House, Congress and local posts for years to come. Obama Gets Messages From Democrats. Will He Listen? November 8, 2010  Critics say Obama needs outsiders in the White House and must to focus more on retail politics. They question his habit of naming insiders to replace exiting insiders and his failure to attend to political details like making allies feel special. November 6, 2010  Republicans are now on top in the House, but the economy's still in a rut. When the new Congress convenes, there will be two very different visions of how to get it unstuck. Guy Raz talks about what's ahead with Greg Mankiw, a former economic adviser for George W. Bush; and Laura Tyson, an adviser in the Clinton administration. 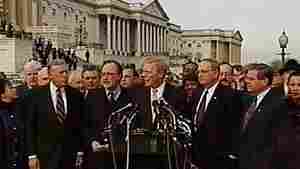 November 6, 2010  Conservative and centrist Democrats were defeated in the House in large numbers this week. Especially hard-hit was the Blue Dog Coalition -- only 23 of its 54 members were re-elected, and it lost two of its leaders, Stephanie Herseth Sandlin of South Dakota and Baron Hill of Indiana. Why Would Nancy Pelosi Want to Lead a Party That Wanted Her As Leader? November 5, 2010  Most Democrats believe, as Pelosi does, that their party got hammered because the economy is limping and the big bills enacted in the 111th Congress were poorly explained and marketed.